The beautiful spring weather has made its way to Dallas just in time for Arts Month! There is no better way to celebrate the arts than by attending some of the events in the Dallas Arts District! Everyone’s favorite is back: The Dallas Arts District Block Party on April 13th is a free community celebration! When you stroll around the area, be sure to play with the latest art installation at Sammons Park. Impulse, which interacts musically with guests. Whether you prefer to wander through an art exhibit. The thrill of a live performance or enjoying a cocktail with a view at a restaurant in the area, there is an event for you in April! Modernity and the City compile the works of several early 20th-century European artists. Their combined works present a powerful statement on industrialization’s impact on urban life. See this fascinating exhibit through April 7th at the Dallas Museum of Art. The Dallas Theater Center presents The Wolves, a sensitive yet bold tale about a high school girls’ soccer team and their fierce desire to succeed in athletics and life. This inspiring play runs through April 14th. The Nasher Sculpture Center is proud to be the first museum to feature the compiled works of contemporary genius Sterling Ruby. Sterling Ruby: Sculpture, through April 21st. Join the fun at Shakespeare’s comedy Twelfth Night in the AT&T Performance Center, Dee & Charles Wyly Theater. This tale of love and pretense runs through April 28th. The Dallas Museum of Art presents Asian Textiles: Art and Trade Along the Silk Road. Garments and ornamental hangings from India, Central Asia, China, and Japan are on exhibit through May 19th. A collection gathered from around the world, Berthe Morisot, Woman Impressionist, is on exhibit in the Dallas Museum of Art through May 26. The exhibition Women Artists in Europe from Monarchy to Modernism focuses on women’s artistic contributions from the late 18th through the early 20th. The exhibition at the Dallas Museum of Art runs through June 9th. Don’t miss The Keir Collection of Islamic Art Gallery at the Dallas Museum of Art through April 26th of 2020. This huge exhibit of private collections is a rare find. Ali Wong: The Milk and Money Tour comes to the Winspear Opera House on April 1st. The standup comedian is widely known for her Netflix specials Hard Knock Wife and Baby Cobra. Your children will love to create with larger than life soft blocks at Imagination Playground on the Great Lawn at Klyde Warren Park. SMU’s Meadows is celebrating their 50th anniversary with a dynamic performance by the Meadows Symphony Orchestra and the Meadows Dance Ensemble. Don’t miss this one of a kind celebration with Meadows at the Winspear, AT&T Performing Arts Center, April 4th. April 4th through 7th, the Dallas Symphony Orchestra presents Sibelius Violin Concerto, Haydn and Nielsen. Renowned violinist Augustin Hadelich masterfully performs. The Dallas Symphony Orchestra presents Voodoo Jazz Sonata at the Arts Mission Oak Cliff on April 5th. An Evening with Susan Graham at the Dallas Symphony Orchestra features the globally recognized mezzo-soprano with the Texas Tech University Orchestra, April 5th. TITAS Presents Pilobolus: Shadowland, The New Adventure on April 5th and 6th in the Moody Performance Hall. Follow the story of two lovers who endeavor to save a rare, magical bird. 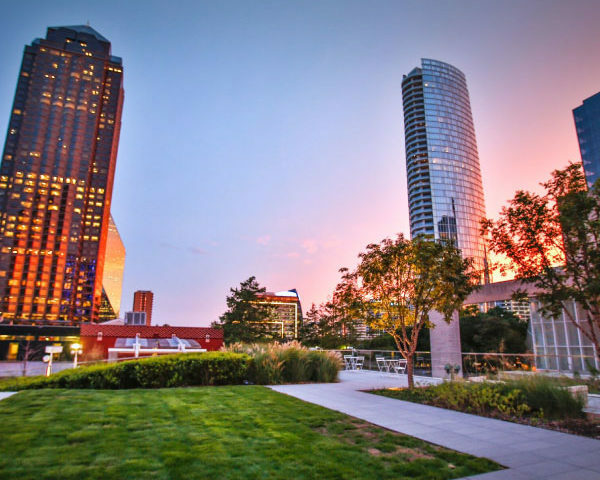 Klyde Warren Park is a great place to see the Dallas skyline. AdEx leads a 20-minute Standing Tour of Downtown Dallas’ historic architecture every Saturday. 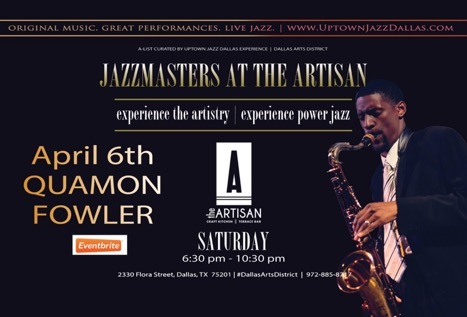 Jazzmasters at the ARTISAN, an Uptown Jazz Dallas Experience is back! Stop by for a chef-prepared meal, craft cocktail and an incredible performance from Quamon Fowler & Friends! Grab your tickets before they are gone here. Topo Chico presents the 2nd Annual Dallas Yoga and Fitness Festival. This is an all-encompassing array of health conscience exhibitions which allow guests to choose from over 40 fitness classes, at the AT&T Performing Arts Center on April 6th. Live from Here with Chris Thile is at the Winspear Opera House on April 6th. Enjoy the many sounds as a live radio broadcast is created on stage. April 6th through October 6th, the Dallas Museum of Art will display America Will Be! Surveying the Contemporary Landscape. On April 7th, the Morton H. Meyerson Symphony Center presents Centuries of Song: Children’s Chorus of Greater Dallas Season Finale. The Dallas Symphony Orchestra impresses with A Musician’s View where stunning chamber works feature pieces by Mozart, Julia Wolfe, and Martinu, at the Morton H. Meyerson Symphony Center on April 8th. April 9th brings Caravan: A Revolution on the Road. An inspiring collaboration from jazz trumpeter Terrence Blanchard, choreographer Rennie Harris, and visual artist Andrew F. Scott. This bold performance takes an impassioned look at 21st-century Black Lives at the Majestic Theater. Your children will have a fun April 9th, 16th and 30th from 11:00 to 12:00! Music and Stories with KidsWorks with fun stories, music, and movement at the Dallas Morning News Reading and Games Room in Klyde Warren Park. On April 10th, the art installation Impulse will be unveiled at Sammons Park. This art piece interacts to a guest’s touch with music and light. When the Trolls Go Rolling In, hilarity follows. On April 10th, two 118 foot tall Trolls and classical musicians collide. Don’t miss this amusing performance brought to you by Greater Dallas Youth Orchestra, Dallas Art Fair and Egill Saebjornsson, creator of the Trolls. April 11-13, the Dallas Symphony Orchestra performs 1812 Overture and Bronfman Plays Liszt, featuring DSO Director James Gaffigan; Joshua Habermann directing the Dallas Symphony Chorus; and Yefim Bronfman on piano. An evening of dance awaits on April 12th at the Moody Performance Hall with the Dallas Black Dance Theatre’s Rising Excellence featuring four premier works. Join the Dallas Arts District Block Party on April 13th for a free community celebration! Food trucks, pop-up and featured performers, a community mural and more. The fun will extend throughout the arts district. On April 14th, the Dallas Symphony Orchestra presents Opus 100 – Monica Czausz, Organ Recital Series on the Herman W. and Amelia H. Lay Family Concert Organ at the Morton H. Meyerson Symphony Center. The Moody Performance Hall is the site of Mariachi and Mayan Night, with a nod to the favorite music and dance of Mexico! This powerful performance by The New Philharmonic Orchestra of Irving, Anita Martinez Ballet Folklorico, and Booker T. Washington’s High School for the Performing and Visual Arts’ Mariachi Pegaso, is on April 14th. Treat yourself to Pink Martini with lead singer China Forbes, drawing on the romantic music of the 1940s and 1950s musicals with an added international twist at Strauss Square on April 14th. Julia Wolfe’s Anthracite Fields, with Pulitzer Prize-winning music, evokes the life of coal miners in Pennsylvania. This haunting performance is April 15th in the Moody Performance Hall. Music and the Brain is a fascinating symposium on the effects of music on the human brain. Learn more at the Moody Performance Hall on April 17th. Fabio Luisi Conducts the Dallas Symphony April 18th and 19th at the Morton H. Meyerson Symphony Center. Head over to Strauss Square for Joan Baez Fare Thee Well… Tour 2019 on April 19th. This concert features Joan Baez’s new album. This is her last touring season, so get your tickets now to see this musical legend while you can. American Landscapes with Lonnie Holley is a moving improvisational performance about the history of the United States and Holley’s Deep South roots. This insightful presentation includes cellist Dave Eggar and the SMU Meadows POINT Ensemble. Matt Arnett hosts a Q&A session with the artist before the show. Experience this at the Dallas Museum of Art on April 19th. Hurry to see Jennifer Hudson with the Dallas Symphony Powered by Capital One featuring award-winning actress and recording artist Jennifer Hudson and conducted by Sarah Hicks, on April 20th at the Morton H. Meyerson Symphony Center. 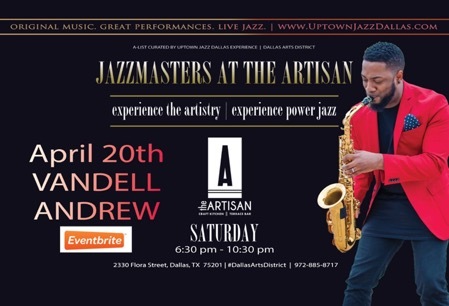 Jazzmasters at the ARTISAN, an Uptown Jazz Dallas Experience is back! Stop by for a chef-prepared meal, craft cocktail and an incredible performance from Vandell Andrew, Saxophonist and Billboard charting recording artist! Grab your tickets or reserve your table before they are gone. The Elevator Project presents Pastry King, A New Play by Scott Zenreich following the antics of a couple who open a pastry restaurant neighboring the self-proclaimed Pastry King. Relationships and blame are deeply felt here, at Studio Theater, April 23rd – May 5th. Musical Celebration of Isa Genzken is presented April 23. Viewing the amazing sculpture of Isa Genzken is truly enough to please patrons for one evening, but this celebration takes it one step further with select chamber members from DSO playing Mozart while patrons take in Genzken’s masterpieces at the Nasher Sculpture Center. Enjoy a moving Easter Sunrise Service as the Dallas Black Dance Theatre performs at St. Paul United Methodist Church on Routh Street, on April 21st. The Dallas Museum of Art is proud to be the first to host the works of Jonas Wood, April 24th through July 14th. Ellen Fullman created the Long String Instrument which produces otherworldly sounds. Experience it for yourself at The Language of Nature. Join Ellen Fullman, Sheryl Anaya, James Talambas, The Cedars Union and members of the DSO for an unforgettable evening at the Boedeker, April 24th. Stravinsky Firebird, with Conductor David Robertson and Orli Shaham on piano, runs April 25th – 28th at the Morton H. Meyerson Symphony Center. On April 26th through May 19th, see Real Women Have Curves at the Dallas Theater Center, Kaleta Humphreys Theater. The story follows Ana, who works at a factory and develops an appreciation for her fellow workers. The Dallas Opera presents Falstaff by Giuseppe Verdi, April 26th and 28th and May 1st and 4th. This adaptation of Shakespeare’s The Merry Wives of Windsor is a comical romp centered on Sir John Flagstaff’s misadventures when romancing more than one woman at a time. Verdigris Ensemble presents a personal glimpse of the people of Dallas in Faces of Dallas at the Arts Mission Oak Cliff on April 26th – 28th. The fun begins on April 27 with Passport to the Park, featuring multicultural performances and activities in Klyde Warren Park. 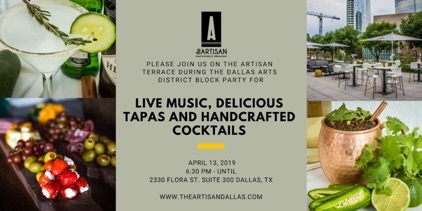 The Artisan is located in the heart of the Dallas Arts District at the KPMG Plaza at Hall Arts. Our market-style restaurant offers a stylish and fun environment where guests can enjoy fresh, locally-sourced foods prepared on-site daily by our incredible culinary team. The Terrace Bar is the perfect setting to enjoy handcrafted cocktails, premium wines, and local craft beers with an incredible view of the beautiful Dallas Arts District. Visitors to the Hall Arts Plaza can enjoy bistro-style coffee service provided by The Artisan at our modern kiosk, located in the lobby of the KPMG Tower. Our beautiful event spaces at the Terrace Bar and Sculpture Walk host upscale gatherings for our corporate clients, social events, and the arts community.Experienced event planners available through G Texas Catering. Supplies available through The Party Resource.